When you choose A-1 Heating and Air Conditioning, you can rest assured that you are working with a professional and highly experienced heating and cooling company. We hire only the most extensively trained and knowledgeable staff, and offer our customers only the highest quality and most dependable products available on the market today. In addition, we offer a variety of specials and deals on our services as an added bonus to the great service you will receive when you hire us as your preferred contractor. Contact us today for more information on our current deals! The perfect system should adapt to your life to deliver the ultimate in energy savings and precision temperature control. We agree. And that’s why we’re proud to be a leading provider of innovative, home heating and cooling systems. Our high-efficiency, Lennox® residential air conditioners, furnaces and HVAC systems help maximize comfort while reducing utility costs. Plus, our Lennox air filters, humidifiers and dehumidifiers help create healthier and cleaner indoor environments. START WITH UP TO $1,250 IN REBATES. 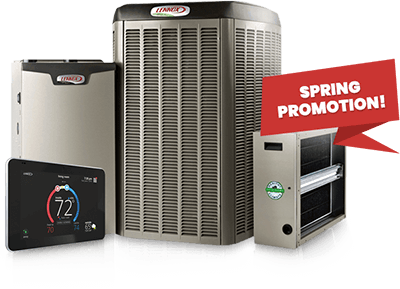 * Save on a complete qualifying Lennox® home comfort system that includes a gas furnace or blower coil, an air conditioner or heat pump and thermostat. Enjoy additional product rebates when you purchase an iComfort® S30 Smart thermostat, iHarmony ® zoning and a PureAir™ system. GET UP TO A $150 REBATE ON A WI-FI THERMOSTAT. * Save now on the iComfort® S30 and save every month on utility bills. Anytime your routine or weather changes, the iComfort S30 smartly adapts to reduce your energy costs. GET UP TO A $150 REBATE ON ZONING. * Enhance your comfort and savings with iHarmony® zoning, a major advance in precision climate control. GET UP TO A $150 REBATE ON PUREAIR™. * Enjoy more savings and fewer pollutants with a PureAir™ system, which cleans the air inside your home better than any other single system you can buy. *Rebate requires purchase of qualifying items and submission of a completed rebate form (with proof of purchase) to www.lennoxconsumerrebates.com no later than July 5, 2019. Rebate is paid in the form of a Lennox Visa prepaid debit card. Card is subject to terms and conditions found or referenced on card and expires 12 months after issuance. Conditions apply. See www.Lennox.com for complete rebate terms and conditions.